This page contains information on prototype valve circuits. 1. 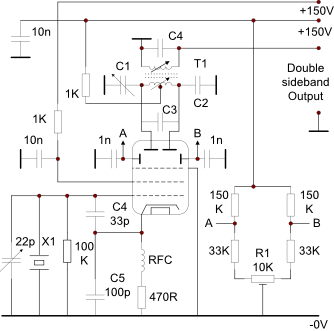 This circuit shows a crystal controlled, self oscillating single balanced modulator used to generate double sideband signals. The details shown are specifically for a 6AR8 beam deflection valve. This circuit will also oscillate with the anode and deflector voltages removed as the accelerator on pin 3 acts as an anode - a 3Hz shift in frequency was noted at 3.395MHz with and without the anode voltage present. With the anodes connected to the DC supply the accelerator current was 200uA and when they were disconnected the accelerator current increased to 2mA. In the latter case the RF level at the cathode was about 20% less. The prototype circuit as shown gave a minimum of 40dB carrier suppression and the final layout gave 56dB. Another 15-20dB should be obtained when the carrier is correctly positioned on the skirt of the SSB filter response. T1 for 3.395Mhz was 15t + 15t bifilar, 9/47 strand Litz close wound on a one quarter inch diameter formar with a dust iron tuning core and C1 = 2-10pF, C2 = 5p6 and C3 = 270pF. The secondary is shown as tuned with a 30 turn winding spaced about 0.5 inch from the primary and a 270pF capacitor but could be a lower impedance un-tuned winding of a few turns as required. Double sideband output is around 8v pk-pk. R1 and C1 are the balance controls and a symmetrical layout will help with obtaining a good balance. Audio may be single ended and fed to point A with point B decoupled to ground or push-pull and fed to both points A and B. In either case non polarised DC isolating capacitors should be used in the audio feed(s). The deflection electrodes should be biased to +20 to +30V. The anode current contains significant harmonics of the oscillator frequency which may appear to make the balance worse than it actually is on broadband measuring instruments like an oscilloscope, hence the second tuned circuit in T1 for measurement purposes. During final construction a small PCB containing a relay switching facility has been added to allow for selecting crystals for each mode. As a result of the additional circuit capacitance, the feedback capacitors in the above circuit have been changed - the 33pF is now 10pF and the 100pF is now 56pF - to allow the 22pF trimmer on each crystal to cover the correct pulling range. 2. 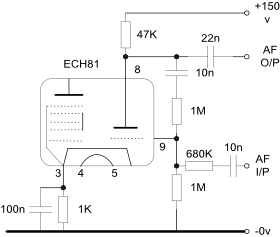 The low level amplitude modulator using the heptode section of an ECH81 has been moved to the Amplitude Modulators page elsewhere on this website. 3. The circuit on the right uses the triode section of an ECH81 as a unity gain phase inverter to provide the out of phase component to drive the balanced modulator at the top of this page. The circuit is not critical but some RF decoupling may be required depending on each user’s application and layout. The incoming audio signal drives deflector electrode A of the balanced modulator and the AF I/P to the right. The AF O/P drives deflection electrode B of the balanced modulator. Non-polarised DC isolation must be provided in the AF feeds to the balanced modulator deflection electrodes.